Drew Sawyer joined us in April 2018 as Phillip Leonian and Edith Rosenbaum Leonian Curator, Photography. Previously, he was Head of Exhibitions and the William J. and Sarah Ross Soter Associate Curator of Photography at the Columbus Museum of Art in Ohio. His most recent exhibition, Family Pictures, explored the legacy of Roy DeCarava’s 1955 book The Sweet Flypaper of Life, and included works by John Edmonds, LaToya Ruby Frazier, Lyle Ashton Harris, Deana Lawson, Lorraine O’Grady, Gordon Parks, Sondra Perry, Ming Smith, and Carrie Mae Weems. At Columbus, he also organized solo exhibitions of the work of Lucy Raven and Allan Sekula, as well as several large-scale thematic exhibitions. He is a co-organizer of the upcoming historical survey, Art after Stonewall, 1969 to 1989, which will tour during the 50th anniversary of the Stonewall Riots in 2019. 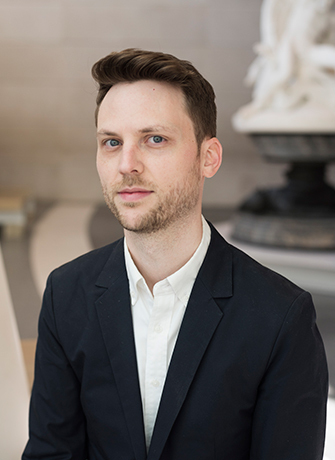 From 2012 to 2015, Drew served as the Beaumont and Nancy Newhall Curatorial Fellow at the Museum of Modern Art in New York. He holds a Ph.D. in Art History and Archaeology from Columbia University, specializing in North American art and visual culture of the nineteenth and twentieth centuries.